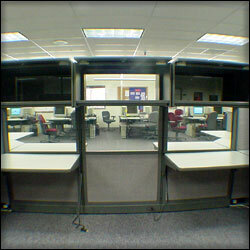 Cubical walls are often designed to absorb noise. Unfortunately what they really absorb is signal. Two people working on the same project are encouraged to sit in their own individual cells and not communicate with each other. This may be fine when it comes to secrecy but it's insane when it comes to communication. And if your organization has a communication problem take a look at your enviroment and ask yourself if people have to overcome the enviroment in order to communicate. 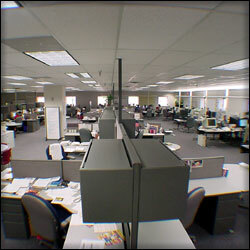 Our team operates in a very large room. The center of the room has workstations for those people on the business side of the house. The accountants, business owners, and even the VP all work in an enviroment where commication is the norm. (We don't need an open door policy, we don't even have walls.) The outside area is used by the coders and the testers. The tables can be (and are) moved frequently allowing programmers to rearrange themselves to fit the needs of the current project. People on one side of the room can quickly look to see if someone on the other side of the room is there and walk over and ask them a question whenever. You can quickly see is anyone needs help and over time receive a steady signal as to what's happening on your project and the other projects. People can work together, move around, and respond quickly simply because they're not in their own little isolation chamber. In XP, the goal is often to get everyone on a project in one room working together. Often a metting room is cannibalized in order to get the customer and the programmers together. In our case we've managed to get everyone on all the projects in the same room working together. The enviroment doesn't encourage isolated individuals or isolated teams. It encourages communication and flexabilty. And what company wouldn't want that?